Trushape Engineering provides and maintains a safe working environment by promoting safe work practices and by adopting a planned and systematic awareness of work health and safety issues. Trushape has created a culture built on our people, management and personnel understand that work health and safety within the workplace takes priority over other operational considerations and our goals based on “Safety 365” are a shared responsibility. 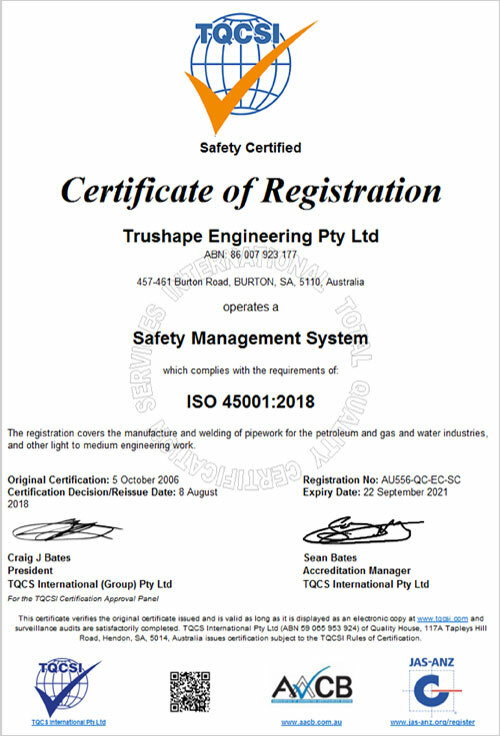 Trushape established its Work Health and Safety Management System in October 2006. We continue to enhance a fully integrated management system that conforms to the requirements of ISO 45001:2018. Trushape continues to provide the required environment, resources and training to ensure our safety culture drives our company goals.